International Space Station (ISS) program managers are currently in the process of conducting an assessment into the long-term configuration of the US Segment of the orbital outpost, as preparations are made for the post-Shuttle era which will see the addition of a new fleet of “Visiting Vehicles” arriving at the Station. Under current plans, only four “open” Common Berthing Mechanism (CBM) ports will be available on ISS after the shuttle fleet is retired – Node 2 Nadir & Zenith, and Node 3 Forward & Aft. Node 2 Nadir & Zenith are currently reserved as the Visiting Vehicle (VV) Primary and Back-up ports respectively, and Node 3 Forward & Aft have issues regarding clearances with other parts of the Station. Node 3 Zenith, although unoccupied, is unusable as the port has been blocked off, due to the fact that nothing could ever be berthed there because of clearances with the Z1 Truss antenna. A Power & Video Grapple Fixture (PVGF) has been installed on Node 3 Zenith instead, which will serve as a stowage location for the Special Purpose Dextrous Manipulator (SPDM) “Dextre”. 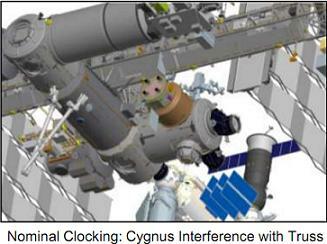 Two key issues are driving the issue of creating more CBM ports on ISS. The first is VV requirements, and the second is future expansion requirements, as noted in expansive Space Station Program Control Board (SSPCB) notes (L2). The VV requirements include a number of issues, the first being the desire for the capability to have two VVs at ISS simultaneously, and also have a back-up port – thus requiring three free CBMs. The second issue is that Node 2 Zenith will be unusable as a Back-up port for Orbital’s Cygnus vehicle, due to the location of a Power & Data Grapple Fixture (PDGF) on Cygnus. NASA, however, are working with Orbital to determine an alternate location for the PDGF, and the SSPCB notes state that “early information is that this looks promising”. Furthermore, Node 2 Zenith is to be the location for a planned Common Docking Adapter (CDA), scheduled to be installed in 2014. A second CDA is also planned for Node 2 Forward. The CDAs would likely utilise the recently announced International Docking System Standard (IDSS), which combines the docking collar of the Androgynous Peripheral Attachment System (APAS), currently in use on the PMAs, with the capture ring of the newly developed Low Impact Docking System (LIDS). According to the SSPCB notes, ISS program managers are also looking into the option of installing the Common Docking Adapter (CDA) onto a PMA, instead of onto a CBM. As a result of the above requirements, Node 2 Zenith will be unusable as a back-up port for any VV after 2014. This would leave only one CBM available for VVs (Node 2 Nadir) – two short of the three CBMs that ISS manager’s desire. Thus, an effort is underway to “find” two extra CBMs on ISS. Many different options are currently under consideration, which were detailed in the most recent set of SSPCB notes. The most recent proposal involves moving the Permanent Multipurpose Module (PMM) – which will be installed onto Node 1 Nadir during STS-133 in February – to the currently unoccupied Node 3 Aft port. An issue associated with this is the fact that the PMM’s Trunnion pins, which are used to hold payloads into the Shuttle’s Payload Bay, will be only inches away from the Functional Cargo Block’s (FGB’s) solar arrays if the current 24 inch berthing clearance rule is observed. The FGB arrays are currently retracted in order to allow the Station’s thermal radiators to rotate, however, the notes state that “extension is the only real option to gain significant clearance”. No camera views would be available to monitor clearances. Another issue associated with moving the PMM to Node 3 Aft is that crews will not be able to access or install the vent release valves used during the Removal & Replacement (R&R) of internal valves. “[The] program could provide different design if necessary to increase clearance,” stated the notes. There would also be close clearances with the CP7 camera and the Cupola during the PMM relocation. The Advanced Resistive Exercise Device (ARED), currently installed in Node 3, would need to be “re-clocked” in order to allow for better access to Node 3’s Aft CBM hatch. The second part of the proposal currently under consideration involves moving the Cupola – which is currently installed on Node 3 Nadir – to Node 2 Forward, which is currently occupied by Pressurised Mating Adapter-2 (PMA-2) in order to facilitate Shuttle dockings. 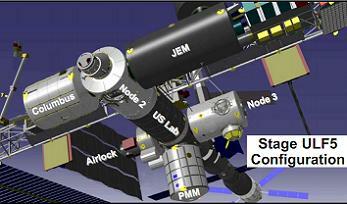 This means that PMA-2 would need to move to another port in order to free up Node 2 Forward for the Cupola. 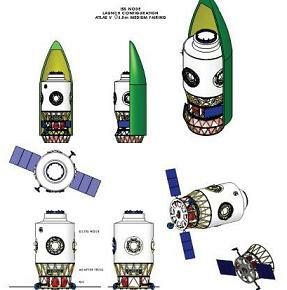 Under original plans, PMA-2 was to be relocated to Node 3 Aft. However, if the PMM is to be installed on Node 3 Aft, an alternate location for PMA-2 would be needed. The ideal location for PMA-2 would be Node 3 Port – which is currently occupied by PMA-3 – as PMAs are the only modules able to be installed on Node 3 Port due to clearances with the Station’s rotating thermal radiators. As such, a plan is being considered to return PMA-3 to Earth on STS-135, as this flight may be the only opportunity to return a PMA for the foreseeable future. If managers deicide to pursue this option, STS-135 would need to launch carrying the Spacelab Pallet (SLP) that was used to deliver PMA-3 to the ISS on STS-92 in 2000. 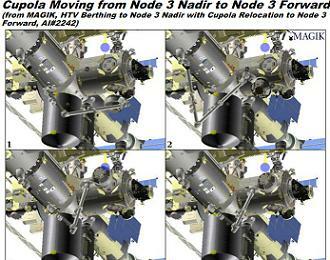 Returning PMA-3 to Earth would free up Node 3 Port for PMA-2 – which would in turn free up Node 2 Forward for the Cupola. ISS managers are also considering the option of installing the Cupola onto Node 1 Nadir. The original plan of relocating the Cupola to Node 3 Forward was not favoured by JSC’s flight crew office. Moving the PMM to Node 3 Aft and the Cupola to Node 3 Forward would free up Node 1 Nadir and Node 3 Nadir for VVs or future expansion, with expansion being constrained by the “Quest” airlock Nadir High Pressure Gas Tank (HPGT), clearances with potential VVs on Node 3 Nadir, and Soyuz docking envelopes at the nearby Mini Research Module-1 (MRM-1). Another potential option to create more CBMs on ISS is to install Node 4, also known as the Docking Hub System (DHS) onto Node 2 Forward. Node 4 would be constructed from the Node 1 Structural Test Article (STA), which is currently undergoing refurbishment work in the Space Station Processing Facility (SSPF) at the Kennedy Space Center (KSC) in Florida. The Node 1 STA was originally planned to be launched into space as the actual Node 1 module, but following some manufacturing errors made by Boeing in 1995, it was decided to turn it into a test article. The structure that was then intended to be Node 2 was used for Node 1 instead. Node 4 would likely be pre-integrated with two or three IDSS ports, and include a few CBM ports for future expansion of the station, likely by experimental inflatable modules. It would be launched atop an Atlas V rocket from KSC, and transported to the ISS via the currently unfunded Advanced Rendezvous & Docking Vehicle (ARDV). In order to free up space for Node 4, PMA-2 would have to be relocated from Node 2 Forward to either Node 3 Port or Node 3 Aft. However, such potential additions are only discussions at this stage, given the lack of funding. (Lead Image: NASA.gov. Images within the article: L2 presentations).